Young teenage boys have a way of terrorizing most people they come across. Between the developmental changes of puberty and realizing their social identity, the end result is generally immaturity and chaos at its finest. Especially when it comes to other teenage girls. 13-year-old Grace Feekes of Adams County, Iowa was getting a full dose of "teenage boy nonsense" when she reported to her friends that she had started hunting with her dad. "Girls don't know how to hunt, Girls can't do that" teased the boys. It lit a fire in young Grace and she set out to prove them wrong&apos;¦something she'd do in spades. It was the first week of January and Grace and her father Mike, were a part of a hunting party that was conducting drives to try and punch tags on a more than a few deer. Positioned along a fenceline where two fingers of timber came together, Grace and dad started their walk to get to an area where they'd have a great vantage point on any deer that might be passing through. "We walked through a cornfield, a small band a timber -- all overgrown with vines, cockaburrs and small cedar trees -- and over a frozen stream. I was so excited, I told my dad 'feel my heartbeat -- it is beating so hard'," shared Grace. Right before the pair reached their spot, dad spied the top of a buck's rack just cresting over the hill 75 yards in front of them. The pair hit the deck and belly crawled towards the deer, hoping to get a jump on them. Just as they got to a spot where they could see the deer, the buck busted them and took off running. Neither Grace nor her father was able to get a shot off, but that's when things got interesting. 40 yards to their south, they spotted a doe leading a very nice buck charging from the timber. Grace then spotted another buck...the biggest buck she'd ever laid eyes on...right behind the deer her father shot at. Grace took the shot and Mike noticed that the buck stumbled before sprinting back into the timber. Grace was sure she had missed. At this point there was an explosion of whitetails bursting out of the woods. At least 30-40 deer came pouring out in every which way. It was the most amazing wildlife experience Grace had ever seen. After the chaos died down, Mike and Grace promptly checked on the status of the buck. Out in a pasture, Mike spotted a big rack sticking up out the grass. She had dropped the brute! "When the rest of our party got there they assumed that my dad shot it. They were in shock, and very excited for me when then found out that it was MY trophy buck lying before our eyes. We started the long walk back to get the truck. On the way all I could think about was that great big rack, my first kill!" reports Grace. She then thought about the boy's taunts and remembered something her Grandpa Feekess always told her when she'd say to him she couldn't do something. Can't died in the cornfield. "I looked at my dad and said, 'Can't died in a cornfield today dad!' My dad said that I should name my buck "Can't". So that was the day that "Can't" died. 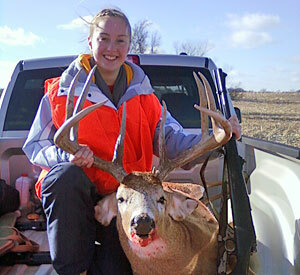 "Can't" scored 160 3/8 inches net typical, making the Boone & Crockett record book.